This system of healing is based on the five elements that are found in all living things—ether, air, fire, water, and earth—which are the building blocks of life. It unites us all as humans, yet we have a unique set of differences that are characterized by ‘doshas’. How the three doshas appear, and in what proportion, is what makes each of us unique. We were given a detailed quiz to identify the characteristics which make up our specific body types. Each type has a set of traits that make the distinction. One is Vata, (those resembling the wind), the delicate, hyper, long-limbed, lean body, unsettled and talkative one who grazes throughout the day. Then there is Pitta ( one of a fiery nature) which may be the typical “Type A” personality with a strong appetite, fiery and intense with a medium build. Kapha (one of solid nature) is the more relaxed, easy going and nurturing personality. While some typify the exact type, many of us may have a mixture of these tendencies, but can identify with at least one or two. The key is to understand the role these doshas play as they are in constant flux in response to the external stimulus such as weather, lifestyle, and stress. We then had a thorough and amusing introduction to each of the dosha’s specific characteristics by Dr. Suhas Kshirsagar. He was by far the most fun presenter of the weekend. He never revealed his own specific dosha characteristics, but he was able to portray the most entertaining descriptions of each distinctive type. As the day progressed we were introduced to the Primordial Sound meditation and its benefits for health and well-being. According to some studies practicing meditation can be effective to reduce blood pressure, symptoms of irritable bowel syndrome, anxiety and depression, and insomnia. It is also considered one of the key elements to living a balanced life and was integrated into the daily program. 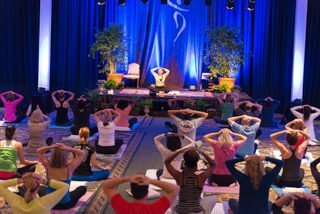 It was emphasized as a most important ingredient, especially when one meditates on a specific mantra that is personalized for each individual. We are living in an age of over-stimulation and excessive uses of outside forces from Electromagnetic Frequencies (EMF’s), digital devices, social media and the ubiquitous influence of technology. The practice of restful awareness via meditation is now proven to be most beneficial for our overall well-being. One take away from this experience is to learn how to become mindful through meditation. To connect with all of your senses, clear away the toxins, get into a routine of healing practices to restore your body’s natural balance to heal itself. The second day began with a group meditation and an introduction to Ayurvedic nutrition from Kelly Greene. Then Dr. Suhas Kshirsager shared an in-depth lesson in learning how to eat to balance your dosha. Then at our lunch break, there was a book signing with Dr. Suhas Kshirsager Change Your Schedule, Change Your Life: How to Harness the Power of Clock Genes to Lose Weight, Optimize Your Workout, and Finally Get a Good Night’s Sleep. This was followed by an in-depth Ayurvedic cooking demonstration with Chef Johnny Brannigan. He told us how he became a vegetarian and vegan chef. Through his experience with the Maharishi meditation, he acquired a deep knowledge base in Vedic wisdom and holistic medicine, as well as a lifelong love of food and cooking. His passion for this practice of nourishment was a veritable feast for all of the senses, with a lesson in the diversity of six distinct tastes that satisfy our hunger. Chef Johnny Brannigan has published a book “Eat Taste Heal ” He explained the six tastes or Rasas that are distinguished in the Ayurvedic diet are sweet, sour, salty, pungent, astringent and bitter. These tastes originate from the five elements and transmit their properties. 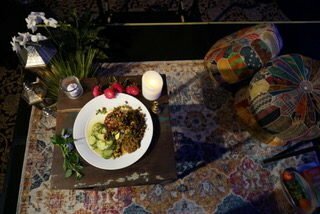 After a dosha-balanced lunch, full-bellied and relaxed, the fashionably forward Dr. Mona Saint explored and explained the Emotions and Stress Management (she also spoke on the last day about Balancing Through the Senses). We had more insightful info on the benefits of Mindful Movement and learning how to read your own body signals. Our bodies are a self-regulating system and we just need to get out of the way, get rid of negative habits (which is not so easy) and let it heal itself. You must nourish your body, mind and your soul. I missed out on the scrumptious dinner feast later that night prepared by Chef Brannigan as I had scheduled a wellness treatment at the Ocean Pearl Spa at the resort. The Honey Pino Dream Body Treatment was just what the doctor ordered to soothe my world-weary mind and body. The resort amenities and well-appointed rooms were the matched this healing retreat experience perfectly. The highly skilled aesthetician slathered my body with real honey, and also included a Milk and Honey Face Mask. This 80-minute treatment uses myofascial massage techniques, and relieved my muscle tension by unwinding the tissue and increasing the microcirculation of the body. This unique healing treatment utilized a Propolis Beeswax Pad to boost the immune system and applied the honey to relieve inflammation and soften the skin. Although I skipped a most notable dinner, my body thanked me for receiving such tender, loving care. I learned in the seminar is that it’s not just what we eat that nourishes us. There is evidence-based research on the powerful influence of mind, body, spirit. From our thoughts, to our relationships, our environment, and the necessity for movement – many aspects influence our health. The importance of touch, intimacy, breath, slowing down to stop and smell the roses are all influential. Everything in our environment is actually our extended body, from nature to people to home to furniture. By the third day, all outside stress had taken a back seat. Especially since I had committed to a digital detox, although I have to admit, I still checked out my iPhone from time to time, but with limited access. And I did give up entirely on my iPad and laptop. In fact, I did not even speak to anyone else in the “outside world,“ just the participants of the event. This enabled me to immerse myself in the experience as if nothing else mattered. I cast all of my mundane stress aside and felt enveloped by the warm, caring staff and intense transformation forces. Read part two, where we discuss Nomophobia here. Part three, which you can read here, shares some tips on how to balance your life. 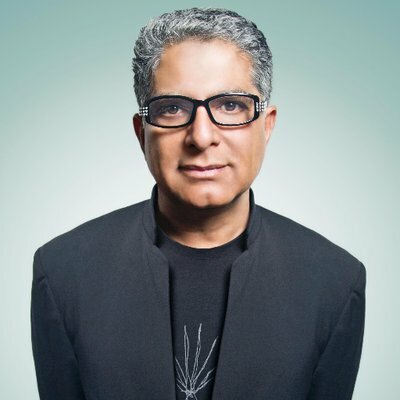 Living in Balance With Deepak Chopra | Live the 5 Star Life Without Limits! 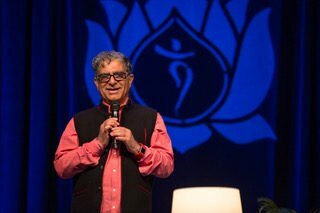 7 Tips for Living in Balance: What I Learned From My Retreat With Deepak Chopra | Live the 5 Star Life Without Limits! 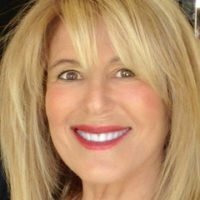 Marjorie Hope Rothstein is a spa trends specialist, passionate about exploring the art of living well, naturally (especially ethical and sustainable). As a luxe life-stylist, her mission is uplifting and inspiring her clients to live their best life now via healthy lifestyle trends. Beyond the Heart of Hollywood, her pleasure is sharing the latest in celebrity beauty secrets, wellness travel and healing retreats. Her secret passion is researching becoming ageless, while on her own quest to discover leading edge beauty breakthroughs. With her finger on the pulse of new-aging innovations, including vibrant health and radiant beauty, Rothstein believes that the real healthcare of the future is preventive self-care. The future begins now! The first step is knowledge and learning about the keys to vitality. In search of the secrets to longevity, she is a consultant in the field of spas and how they contribute to healthy lifestyles through wellness and evidence based longevity products. Rothstein explores natural beauty that supports youth from the inside-out.